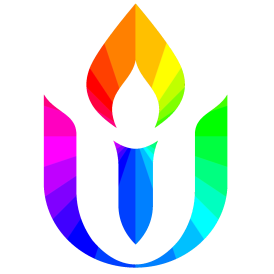 This year we’ve launched a new program called “Soul Matters.” This is a UU theme-based approach to worship and congregational life with developed resources to help explore the theme in a wide variety of ways. Each month will have a spiritual theme (see below) which we will see as the underlying theme during most of our worship services, including soulful sundown. Our Religious Education program will use the themes as the foundation for Sunday morning RE classes, coming of age, Sr. High and potential adult learning opportunities. Our small group ministry program, or chalice circles, will use the themes in their monthly gatherings and other affiliated groups and committees will be invited to use the resources and explore the themes as they are comfortable. We will also weave the theme into our aesthetics design of the Sunday chancel space, on the order f service cover and provide individual tools to explore theme them on your own with reflection questions and spiritual exercises. We hope this will be a way for our community for foster a shared space spiritual growth and connection. Many of our readings, questions, exercises and other resources come from the Soul Matters Sharing Circle, a group of 130 congregations who use monthly themes and share resources and ideas. Each month we will introduce the Plate Partner for the month, a non-profit whose work and mission are connected with justice issues. The first Sunday of the month is our Justice Sunday, when the worship theme, sermon and children’s RE will connect with and honor the work of the plate partner. Together with Plate Partners and the people who nominated them, Rev. Sara and the Social Justice Council will explore opportunities through collaborative programming (ex: book discussion, arts opportunity, issue forum, workshop etc). For more information about the plate partners below, please visit our plate partner webpage.